A proponent of Darwinian evolution was Ernst Haeckel, and he was so het up about proving evolution, he made some drawings about it. Ever heard of "ontology recapitulates phylogeny"? That's the fantasy that an embryo goes through the various stages of evolutionary history, and Ernie illustrated it. With fake drawings. The concept has been lassoed and hog-tied for a mighty long time. But "science" must prevail, even if dishonesty is necessary! 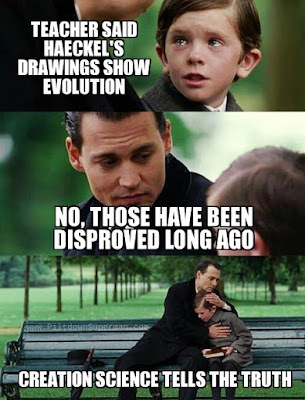 So, even though government school indoctrinators and textbook writers know that Haeckel's material was proved to be fake, they use them anyway! Some people have tried to redeem him. I've even had people comment that it doesn't matter if they drawings are fake, what they show is true. Sure, Poindexter. I bet you believe in square circles, too. Can't let people know there's a Creator God, now, can we? 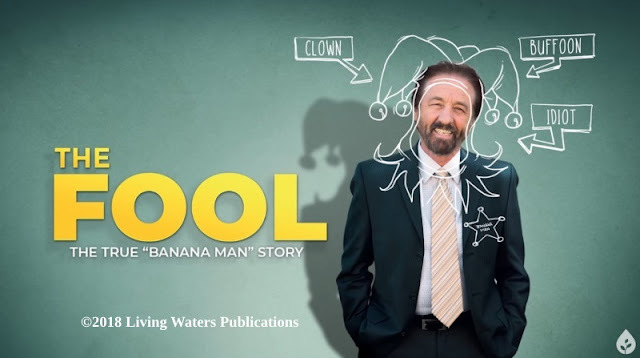 Mayhaps they keep bringing this nonsense back is because they use it to support abortion. There are superficial resemblances to gill slits, tails, and the like. Let's have an honest medical doctor explain. “Generations of biology students may have been misled by a famous set of drawings of embryos published 123 years ago by the German biologist Ernst Haeckel.” Science magazine is referring to Haeckel’s sketches of diverse animal embryos first published in 1874 (Figure 1). They report that Haeckel fraudulently minimized major differences between animals at the earliest developmental stages. This fraud is peculiar because it is being “rediscovered” by new research. Remarkably, Science notes that some embryologists of Haeckel’s day had doubts about the drawing’s accuracy, and his peers actually got him to admit he used “artistic license.” Yet these drawings (or similar reproductions) have been incorporated into nearly every major biology textbook ever since. So, unlike Piltdown Man, Archaeoraptor, and other evolutionary frauds that only temporarily duped everyone, Haeckel’s blunder misleads to this day. To read the rest, click on "Major Evolutionary Blunders: Haeckel's Embryos Born of Evolutionary Imagination". You may also want to see "Haeckel, Fraud, Deceit and Evolutionary Education".